For many years, the Point-a-la-Renommee Lighthouse watched over the waters of the Gulf of St. Lawrence in Quebec, Canada guiding mariners to safety. In 1977, the tower was moved to Quebec City to be recognized as a tourist attraction and for 20 years this is where the lighthouse stayed. It was decided it should be returned to its original home on the historic site at Land's End on the Gaspesie Peninsula where it could once again overlook the Gulf of St. Lawrence. 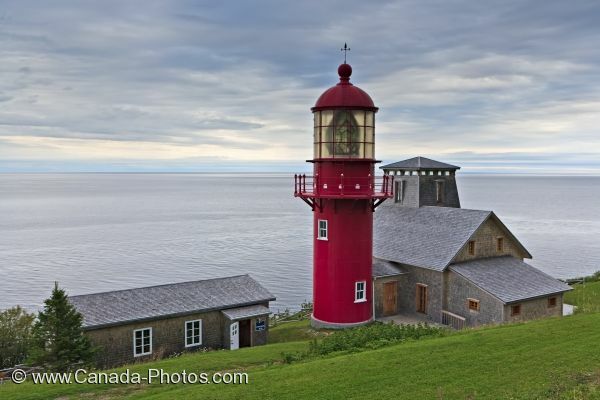 Painted in bright red with a large beacon atop, the Point-a-la Renommee Lighthouse has become an important icon to the people of the Gaspesie Peninsula and the surrounding area. It is now considered to be one of the most traveled lighthouses throughout the world. Visitors to the Gaspesie Peninsula can tour through the Point-a-la-Renommee Lighthouse where exhibits are displayed and one can learn the history of the lighthouse while enjoying the stunning scenery of the Gulf of St. Lawrence. Picture of the large red tower which houses the Point-a-la-Renommee Lighthouse and watches over the Gulf of St. Lawrence. Point-a-la-Renommee Lighthouse, Historic Site, Land's End, Gaspesie, Gaspesie Peninsula, Highway 132, Gulf of St Lawrence, Quebec, Canada. Most travelled lighthouse in the world.